Nerdist reporter Dan Casey was lucky enough to get a short conversation in with Jon Favreau at the Solo: A Star Wars Story premier. 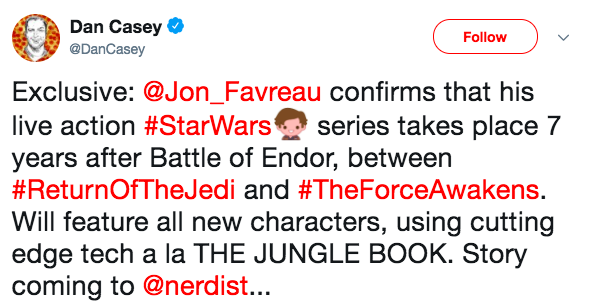 Casey took to Twitter to reveal that Favreau's series will feature a new cast of characters and will take place seven years after the Battle of Endor, and will use "cutting edge tech" and CGI as in Favreau's renowned work, The Jungle Book. The new Star Wars series will be available through Disney's upcoming streaming service.